SUMMARY: Illustrated positive training exercises using Ian Dunbar’s now treat-prompt classic method. AUDIENCE: First-dog owners about to adopt a dog. REVIEW: Another must-read, if only for how much clout Dr Dunbar enjoys among positive trainers. 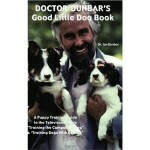 Ian Dunbar has acquired a solid reputation as one of the pioneers of humane, gentle training methods. It gives complete, structured, illustrated, tangible and clear guidance on teaching your dog basic canine manners. It also touches on subjects of lure-weening, behaviour extinction, etc. in practical, layman’s terms. I did not enjoy it as much as I thought I would, probably because it aims at being a manual for dog owners, so not that much technical knowledge to be gleaned. Also, his methods have been re-hashed by countless positive trainers since publication. So I wouldn’t buy it to access unique, technical information, but more to credit the guy with practically inventing positive dog training methods. Browse the Book Review archive. Genre: owner manual. Author: Dunbar Ian. Reading Level: Owners. Star: 3. Bookmark the permalink. Post a comment or leave a trackback: Trackback URL.